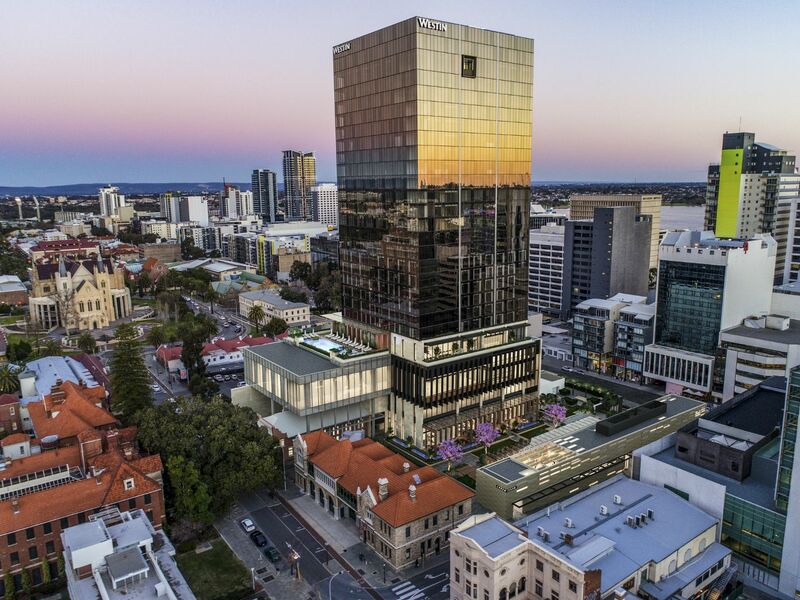 Perth, Western Australia—August 2018… Perth’s newest five-star hotel, the 26-story Westin Perth features high ceilings, lots of natural light in the public spaces, and a 2,000-piece collection of Australian art. In addition to 368 guest rooms and suites and a lovely lobby decorated in natural, neutral tones, it offers a lounge, day spa, infinity pool, outdoor pool, gym and fitness studio. Levels 1 and 2 feature nine flexible event spaces, some of which can be combined, including the three-segment, 800 square meter (8,611 square foot) Grand Ballroom. The system spans the area from below ground to Level 5, connected with fiber and managed with three Q-SYS Core 510i integrated processors mounted in the central racks on Level 2. “We divide the Q-SYS Core processors and switches to serve different floor locations so if one were to go down, it wouldn’t take the whole system out,” notes Mitchell. Switches are configured in three stacks to match the three Q-SYS Core processors, with each stack operating as a single logical switch. The stacks are linked, and audio flows between the Q-SYS Core processors via AES67 on a separate VLAN, so video and audio can be routed to and from all endpoints in the network. Except for some Crestron speakers in the higher ceilings and K-array speakers in a few very narrow spaces, most of the speakers and power amplifiers are QSC, so the Q-SYS Core processors send audio to the amplifiers using Q-LAN. Each of the unDX2IO+ wall plates in the ballroom and meeting rooms provides two front-panel balanced XLR mic/line inputs and outputs, plus two balanced line inputs on the side of the unit for use with an expansion plate. Some spaces have Attero Tech unD3IO wall plates, which provide XLR, RCA, and 3.5 mm stereo input and output. These wall panels enable local audio to be patched to the network and played over the sound system.